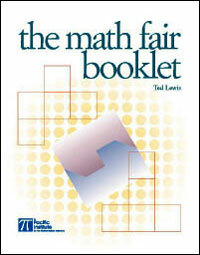 Our puzzles section has a collection of math fair puzzles. In addition, there are several websites that have good math-based puzzles, some of which are directly useable in a math fair. Puzzles.com. This is Thinkfun's puzzle site. As well as puzzles, it has links to many other useful sites. Puzzles.com Puzzles in Education is a collection of math fair types of puzzles. That's a good problem. This is Galileo.org's math fair page. The puzzles here are organized by level. No solutions are provided. NRICH. This is one of Cambridge university's math enrichment sites, aimed at students for ages 5 to 19. The problems are arranged by levels or stage. Although they are good problems, many are more suitable for classroom activities than for presentation at a math fair. AIMS Puzzle Corner. A collection of over 100 math puzzles presented by the AIMS Education Foundation. Solutions are provided online. The English and French versions of the Math Fair Booklet, and the Puzzles and Math Connections Booklet can be bought for $10.00 CAD, simply click on the picture of the book above. There is also a Spanish version of the Math Fair Booklet (electronic copy only) - contact Sean Graves (sgraves@ualberta.ca), Ted Lewis (tlewis@math.ualberta.ca) or Tiina Hohn (HohnT@macewan.ca). 1000 Playthinks, Ivan Moscovich, Workman Publishing, New York, 2001. The Giant Book of Math Fun, Raymond Blum, Glen Vecchione, Kurt Smith, Steve Ryan, Adam Hart-Davis, Sterling Publishing, 1999. Below are more sources of problems and puzzles. Martin Gardner, one of our patrons, has written many excellent books on mathematical recreations (which was the name of his column that he conducted for years in Scientific American). We list some of his books below but recommend that you investigate many others. Most public libraries stock a good selection of his books. Another excellent source of puzzles are the books by Dennis Shasha featuring Dr. Ecco. The majority of his puzzles are original, and are wonderful for high-school students. A recent book of his, listed below, includes puzzles that are accessible to students in the elementary and junior high or middle school grades. We should also mention that quite a few of the problems in the collections by Brian Bolt are almost "math fair ready". From the point of view of sources of problems for math fairs, the ones listed here are probably his best. Entertaining Mathematical Puzzles, Martin Gardner, Dover, 1961. Aha! Insight, Martin Gardner, W.H.Freeman and Company, New York, 1978. The Mathematical Puzzles of Sam Loyd, edited by Martin Gardner, Dover, 1959. More Mathematical Puzzles of Sam Loyd, edited by Martin Gardner, Dover, 1960. The Puzzler's Elusion, a Tale of Fraud, Pursuit, and the Art of Logic, Dennis Shasha, Thunder's Mouth Press, 2006. 536 Puzzles and Curious problems, by Henry Ernest Dudeney, edited by Martin Gardner, Charles Scribner's Sons, New York, 1967. The Moscow Puzzles---359 Mathematical Recreations, Boris A. Kordemski, edited by Martin Gardner, Dover, New York, 1992. The Amazing Mathematical Amusement Arcade, Brian Bolt, Cambridge Univ Press, 1980. The Mathematical Funfair, Brian Bolt, Cambridge Univ Press, 1985. Mathematical Cavalcade, Brian Bolt, Cambridge Univ Press, 1988. A Mathematical Jamboree, Brian Bolt, Cambridge Univ Press, 1991.